You are here: Home / Pregnancy / Alcohol-Free Drinks for National Margarita Day! It’s National Margarita Day..what a great way to visualize the end of winter. But if you’re pregnant, you definitely DON’t want to go for a real ‘Rita. Instead check out these drinks that are not only refreshing, but also healthy. Being the Designated Driver gets tiring when you just sip on club soda with lime—sometimes you need more. Luckily, my Registered Dietitian friends have shared these Alcohol-Free Drink recipes! If the idea of Cherry Limeade makes you wax poetic about simpler times gone by, Lindsay at TheLeanGreenBean is right there with you! She says this recipe reminds her of the Cherry Limeade from Sonic, which she used to order after swim team practice as a kid. Best of all, this recipe has just 4 ingredients and not much added sugar. Almost everyone in the south drinks iced tea even when it’s not summer. And in the Deep South, they love sweet tea so much, it’s often named in country songs! Fellow Texas blogger Amber from HomeMadeNutrition, has made a great substitute for sweet tea in her Sweet Passion Tea Lemonade. This recipe uses Tazo Passion Tea, which is made of hibiscus flowers, orange peel, rose hips, licorice root and passion fruit flavors. Hibiscus is not recommended during pregnancy, due to unknown health effects, so skip this if you’re pregnant or trying to be! Try substituting these caffeine-free teas instead: Tazo Glazed Lemon Loaf or Tazo Organic Spicy Ginger. Finally from Erin, TheMinimalistRD, we have another lemonade recipe, using an herb that’s plentiful right now–Basil. This unlikely combo of ingredients turns out a super antioxidant-rich drink: Wild Blueberry Basil Lemonade. And to top it off, it’s sweetened with honey. Wondering how to include more ginger in your diet? While it adds great taste, it’s also a good idea if you’re having pregnancy or any other kind of “queasies”. This Gingery Citrus Refresher from Courtney over at SavorLifeNutrition is sure to quench your thirst, if not your nausea. Orange and dates are the natural sweeteners in this tea–that’s a win-win! LOVE these options! Being pregnant I can go for all the alcohol free options I can get! 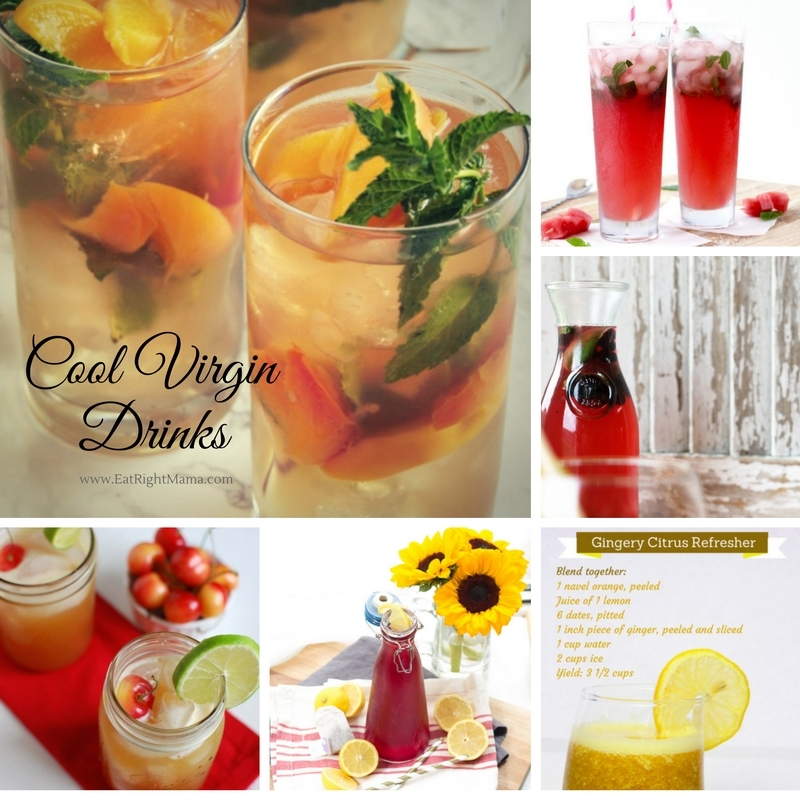 This is a great collection of alcohol-free mocktails! They can be enjoyed even if you’re not pregnant! I’ll admit that I did celebrate National Margarita Day with a skinny margarita, but all these mocktail versions sound fabulous as well. Cheers! These are fantastic…my husband and I decided to try a dry February so these recipes came at the perfect time. Yes, sometimes we need a little inspiration! Cheers! These are such pretty and better for you drink options. Love a good mocktail. Thanks for sharing, Bridget!